Mr. Field's father, Bennett Field, was a drum major in the civil war. C. Field's grandfather, E. Fields, came to America with his family from England and fought in the revolutionary war. Our subject's mother, Fanny Waite, was born in New England. Our subject, Mr. Chester Field, enlisted in the civil war under Captain Terry in the One Hundred and Fifth Illinois Volunteers, being assigned to guard duty, and as fifer in his company, but because of an accident to his son, which was serious, he did not go with his company. On June 25, 1857, Mr. Field was united in marriage to Miss Maria Temple, whose father came from England. Mr. and Mrs. Field are the parents of five children: James, Bennett, Jennie, and William, deceased, and Edmons. In 1873, our subject, with his family, in a covered wagon, started to Nebraska from Clayton county, Iowa, and after reaching there rented land near Norfolk, where they lived seven years; here they did not have very good success, as they lost their entire crops two successive years by the grasshopper raids, and also lost crops by the hot winds and drouth. In 1880 Mr. Field went to Antelope county, Nebraska, to start anew, as he had a family and must make a living for them. He took up a homestead in section twenty-six, township twenty-eight, range seven, and also a timber claim in section twenty-three, township twenty-eight, range seven; he lived in a wagon on the homestead until he built a sod house in which they lived twelve years, then put up a good frame house and otherwise improved the place. Deer and antelope were plentiful in the early days, and our subject and family experienced many hardships here; also they fought prairie fires, nearly losing their home and all their possessions. In 1893 and 1894 our subject lost all his crops by the hot winds, but he has stuck to farming and has made a good competency for himself and family, and is now retired. He has resided in the village of Royal the last few years, where he holds the respect and esteem of all who know him. Harlow H. Freeman, of Custer county, a progressive farmer and prominent citizen of central Nebraska, is a member of a family that has been very influential in developing that section of the state. He was born in Kalamazoo county, Michigan, July 16, 1858, son of Parish Moses and Mary A. (Davis) Freeman. The parents and other members of the family are given fuller mention in connection with the sketch of the father, which appears in this work. He is still living in Valley county, where he located in 1878. Harlow H. Freeman came with his parents to Lancaster county, Nebraska, in the spring of 1878 and in August of that year removed to Valley county, where he secured a homestead. He was married December 23, 1882, to Fannie A. Hall, their union taking place at Grand Island, Nebraska. Her parents, William and Almira (Raner) Hall natives of New York, came from Kalamazoo county, Michigan, to Nebraska, and took a homestead on section fourteen, township seventeen, range sixteen, where they located in September, 1878. They were natives of New York and were married at Oswego, that state, in 1850. They had two sons and two daughters, and two of their children are now living: Julia A., wife of Charlie Freeman, and Mrs. Harlow Freeman. Mr. Hall died on the homestead farm December 26, 1907, aged eighty-two years, and his widow died January 30, 1910, aged eighty-one years. They. were among the earliest pioneers of Custer county and were well known throughout the county. Mr. and Mrs. Freeman have three children: Roy R., who married Etta L. Young, March 29, 1906, and lives in Johnson county, Wyoming, has two children; Walter N., unmarried, and living in Wyoming, and Nellie B., wife of Richard R. Lea, of Wyoming. Two children are deceased, and all five were born on the home farm in Custer county. In 1894, Mr. Freeman and his wife left their farm in Valley county, Nebraska, and took up land in Johnson county, Wyoming, so far from railroads that their nearest trading point was Buffalo, the county seat, seventy-five miles distant. In October, 1907, they returned to Nebraska and located on the old Hall homestead. They improved the farm by new buildings and in other ways, and in March, 1909, again went to Wyoming, and disposing of most of their interests there, made a trip through the southern states for pleasure, and at the same time looking for a more desirable location than they had in Nebraska, but not finding anything to their liking, they returned to Custer county, which seemed more desirable than ever after their wanderings. They now reside on the old Hall homestead, half of which lies in Valley county, now a well improved and equipped grain and stock farm. Mr. Freeman is a successful farmer and is interested in all that pertains to the general welfare. In national politics he is a democrat, but in local affairs votes for the man regardless of party lines. lived many years in a "soddy." While living in Wyoming their dwelling was a log house. In this state Mr. Freeman found big game plentiful. With a brother and brother-in-law he killed eleven deer, their first hunting trip. The late William Gale Eastman was one of the early settlers of Nebraska, spending many years before his death in Custer county. He was born at Aurora, Illinois, January 4, 1858, the only child of Daniel and Jane (Gale) Eastman, both of whom died in Illinois. The father, a naive of Canada, was of French parentage, and died in Aurora, February 19, 1862, and the other, a native of Long Island, died in 1883. The father settled in Illinois in an early day, as a physician in a French-Canadian colony, but died when his son was a small child. After receiving an education in the schools of his native state, Mr. Eatsman [sic] took up farming as an occupation, and at the age of sixteen years removed to York county, Nebraska, where he found employment working for farmers and eventually took up farming on his own account. On September 19, 1877, he married Rachel J. Hickenbottom, who was born in Appanoose county, Iowa, and came to York, Nebraska, in 1874. She was a teacher in York county schools before her marriage. Her father, Stephen Hickenbottom, was a native of Kentucky; he was one of his parents' two children, who rode with their mother on horseback, the father leading in front, all the way through the wild timber country from Kentucky to central Illinois. He died in Iowa in 1889. The mother, Mary C. Taylor, was born in the Shenandoah Valley of Virginia. She died in Broken Bow, January 11, 1911. 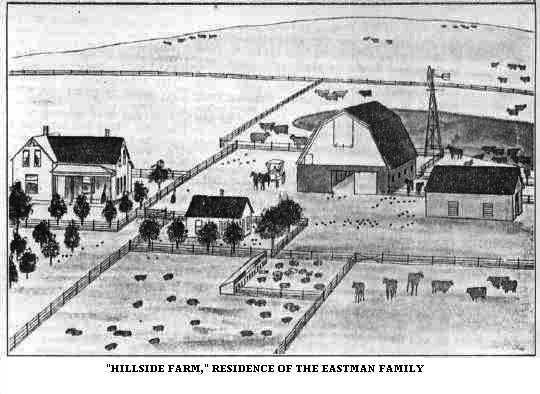 In 1892, Mr. Eastman sold his farming interests in York county, removed to Custer county, remained there one year, then returned to York county, and about eight years later decided to make his permanent home in Custer county, which he did, purchasing one hundred and sixty acres of land on section eleven, township sixteen, range seventeen, where he remained until his death, January 15, 1906. He was survived by his widow and five children, namely: George, died in 1907, leaving a widow and two children; Callie B., is the wife of F. M. Johnson, of Waunetta, Kansas, they have three children; Zella L., married Jesse Oates of Custer county, and have one child; Orpha J., wife of Francis Marsh, of Custer county, has one child; William G., is at home. Mr. Eastman served two terms in the Nebraska legislature, and was most highly esteemed for his intelligence and ability in all his undertakings. He served two terms as county supervisor in Custer county and was for twenty years a local minister for the United Brethren and Methodist churches. He was an earnest christian and a successful farmer, winning many friends by his high character and upright life. He was mourned in many circles, where his presence and influence were sorely missed. He owned six hundred and forty acres of land, which he had developed into a stock and grain farm, well equipped and provided with substantial buildings. His widow still lives on the home place and has a large circle of friends in the community. Mrs. Eastman has three brothers and two sisters in Nebraska: William T., at Broken Bow; James W., in Custer county, and Rolla E., at Callaway; Mrs. Chris Jensen, in Custer county, and Mrs. Frank Moore at Callaway. Mr. and Mrs. Eastman lived in a dugout for a short time in Kansas, later occupying a log house. On coming to their farm in Custer county, they built a "soddy," which was their home until 1905, when their present neat cottage was constructed. A concrete barn is one of the most substantial buildings on the place. We are pleased to give a view of the home and surroundings on another page. Mr. Eastman was originally a republican in politics, but being a man of temperate habits, later worked with the prohibitionists; of late years he supported the candidates of the populist party. Fraternally he was a member of the Modern Woodmen of America and the Modern Brotherhood of America. "Hillside Farm," Residence of the Eastman Family. Among the prominent settlers of eastern Nebraska, we mention the name of Albert W. Cornell as being one of the best known, from the fact that he has spent the past thirty years of his career in this region, and during that time has devoted his best efforts to aiding in the development of the natural resources of Valley county, and helped to build up the community in which he chose his home. He resides on section seven, township eighteen, range fourteen, where he and his family are surrounded by a host of good friends. the spring of 1883. In 1899 Mr. Cornell made final purchase of the farm, having bought out his brothers' interests, and now owns four hundred acres of fine farm and stock land, and also owns one hundred acres of good land in Oklahoma. He keeps on hand about ninety head of cattle and horses, and some two hundred and fifty head of hogs. The house and all stock buildings are supplied with running water, and there are over three miles of hog tight fence enclosing the farm and fields. A view of the home place, one of the finest situations in the county, overlooking Mira valley, is the subject of one of our illustrations on another page. On August 12, 1894, Mr. Cornell was united in marriage to Miss Irene Clift, who was born in Fremont county, Iowa, a daughter of John and Mary (Dameron) Clift, who came to Nebraska City some time after the war and lived a few years in Nebraska City before locating in Fremont county. Mrs. Cornell's father was a Kentuckian by birth, and died February 11, 1900; her mother died April 25, 1900, surviving her husband only a little over two months; they both passed away in Fremont county, Iowa. Mrs. Cornell has three sisters residing in Iowa, one in the state of Washington, one brother in Iowa, and another in Nebraska. Mr. and Mrs. Cornell have had three children, namely: John Cass, Charles Willard and Robert Eugene, all residing under the parental roof. Mr. Cornell is a prosperous and successful man of affairs, and has served as moderator of school district number twenty-three for six years, being still in office. He is one of the younger men among the pioneers of Valley county, and is widely and favorably known. 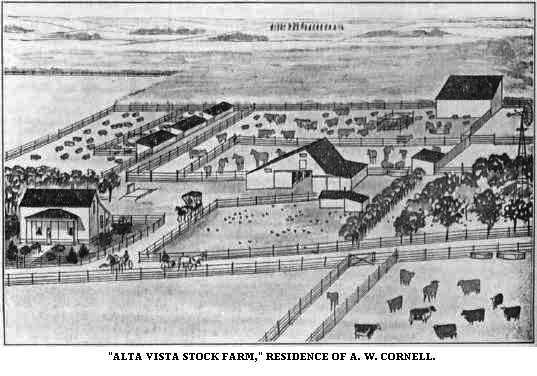 "Alta Vista Stock Farm," Residence of A. W. Cornell. Albert Ahlmann, a highly respected citizen and old settler of northeastern Nebraska, is among the prominent farmers of Pierce county, where he owns a fine farm of three hundred and twenty acres of good land, in the southwest quarter of section twenty-five, township twenty-six, range two. Mr. Ahlmann was born September 16, 1851, in the village of Braunsberg, province of Pommon, Germany, and is the son of Adam and Mina (Manske) Ahlmann. He received his education in his native country, and was raised on a farm owned by his father, where he grew to manhood and in November, 1873, was married to Miss Bertha Ahlmann, daughter of Johan and Fredrika (Schmidt) Ahlmann. After he had been married twenty years, our subject came to America to seek his fortune and build up a home for his family. In 1893 he sailed from Hamburg, Germany, and landed in New York City, and from thence came to Pierce county and took up a homestead, his present location. He began at once making improvements and getting the place in readiness to shelter his family. He built a frame house and made other progressive changes, and one year later went back to Germany after his wife and family, which he brought to America, they sailing from Bremen, Germany, and landing in New York, from whence they came to the home he had prepared. Mr. and Mrs. Ahlmann have had ten children born to them, who are named its follows: Anna, Ida, Minnie, Emil, Herman, Maria, Frederich, William, Albert and Hedwig. Mr. Ahlmann lends his influence to the building up of his home community and gives his whole energy to the work of carrying on his farm and home. He is a member of the German Lutheran church, and is a citizen of whom Pierce county, Nebraska, is proud. Adolph Mogensen, residing on section twenty. of Danneborg precinct, is one of Howard county's oldest settlers and classed among the leading citizens of his locality. He is a gentleman of unusual thrift, energy and perseverance, and has been a potent factor in the development and progress of his county and state. Mr. Mogensen is a native of Sweden, born, December 15, 1850. He is the second child in John and Annie Mogensen's family of six children, and lived with his parents until he was twenty years of age, then struck out for himself taking passage in an emigrant ship for America, landing here in April, 1871. His first location was in Illinois, where he spent two and one-half years. He then came direct to Howard county, Nebraska, in 1873, taking up a homestead on section twenty, township thirteen, range eleven, which he has occupied continuously since that time as his home farm. This land is situated on the middle Loup river bottom, and is improved in the finest possible shape, having substantial farm buildings of all kinds, plenty of shade and fruit trees, including a splendid young orchard, etc. He is engaged in grain and stock raising, and derives a comfortable income from his various enterprises. A brother of our subject, Carl Mogensen, came into Howard county in the same year that Adolph located here. He purchased a tract of railroad land, improved it, and farmed here up to 1882, at that time going into Pierce county, where he has since resided. The father and mother of Mr. Mogensen both died in their native land, and two of the children still live there, the balance of the family having all settled in America. On July 5, 1887, Mr. Mogensen was married to Miss Ellen Sunnerdale, at St. Paul, Nebraska, he having made a trip to Sweden in the winter of 1886, and arranged to have his sweetheart follow him here in the following year to be married. They have had three children, two of whom are now living, Annie and Lillie, both of whom are all at home and are accomplished and charming young women. The family are well known in their vicinity and enjoy many friends. Mr. Mogensen has been closely identified with local affairs during his residence in the region. He was director of district number thirty-one for a number of years, and at the present time is acting in that capacity. Charles P. Rood, son of Burrell and Mary Rood, was born in Swanton, Vermont, May 31, 1823, and at an early age began to shift for himself, his early life being that of a poor boy making his way in life as best he could. On July 13, 1844, Mr. Rood married Miss Marianne Thorngate, at Persia, New York. Mrs. Rood was born in Brownsville, New York, on January 23, 1823. Mr. Rood and his family moved from New York state to Rock Prairie, Wisconsin, in June, 1847, and during the following winter moved to Waushara county, taking up land on the Mecan river near Dakota, two and one-half miles west of Richford township. Nine children were born to Charles and Marianne Rood, named as follows: Hosea W., George B., William Herman, Charles J., Mary Matilda (Mrs. Mansel Davis), Eugenia (Mrs. A. L. Crandall), Emma Jeanetta (Mrs. S. C. Terry), Esther Amy (Mrs. C. E. Crandall), and Walter G. It is a remarkable fact that among these nine children and their families, comprising thirty-one grandchildren, only one death has occurred, that of Minnie May Rood (daughter of Hosea Rood) who departed this life on September 10, 1869. Mr. Rood and his son, William Herman, enlisted in November, 1864, in Company G, Thirty-seventh Wisconsin Infantry at Dakota and were discharged July 27, 1865, at the close of the war. The two older sons, Hosea and George B., had previously enlisted and the father and three sons held an enviable war record, having served from date of their enlistment to the close of the war. In the spring of 1871, many of the families surrounding Dakota, became interested in the idea of leaving Wisconsin and locating as a colony in some of the more western states, either by homesteading government land, or purchasing railroad land. An organization was accordingly formed and at locating committee named, consisting of Charles P. Rood, Nathan B. Prentice, Amos Travis and Charles Wellman. In the latter part of May, 1871, the committee left Waushara, county, Wisconsin, going overland through Iowa into Nebraska, and July 3, found them at Davis creek. While the other members of the committee were out hunting one day, Mr. Rood climbed to a high point known to subsequent history as "Sugar Loaf Hill" or "Happy Jack's Peak" and from this vantage point saw that portion of the beautiful North Loup river valley that lies above the chalk hills. He then and there decided that this beautiful valley should be his future home. He was, however, the only one of the committee so favorably impressed and upon their return his pleadings alone did not sufficiently impress the people in favor of the colony plan, which was therefore abandoned. In September of the same year, however, Mr. Rood, his son, Herman, and son-in-law, Mansell Davis, and a friend named John Sheldon, young men of sturdy stock and splendid character, started west, going directly to the Loup river valley. They liked the country and here John Sheldon and Mansell Davis took homestead claims. They returned to Wisconsin in December having a very severe trip. Mr. Rood's glowing accounts of the possibilities of this new country had so impressed the people that by April 1, 1872, the first emigrant train left for their future Nebraska home. Among the train were Mr. Rood's companions of the former trip, John Sheldon and Mansell Davis; George and Charles Rood and C. H. Wellman started two days later, all reaching the Loup river valley on May 12, 1872. Elder Oscar Babcook went by railroad to Grand Island, and joined the Rood boys there, journeying with them for the remainder of the trip. On March 30, 1874, Mr. Rood, the principal subject of this sketch, with his daughter, Eugenia, and Elder True, started from Dakota, Wisconsin, making the seven hundred mile trip to North Loup in a month. Mr. Rood took up land in Mira Creek valley four miles west of North Loup, being joined later by his son, Herman, and daughter, Emma. Having prepared his dugout home, Mr. Rood returned to Wisconsin by rail in December and on May 18, the following year, again started west, bringing with him Mrs. Rood and the remaining children, reaching the Nebraska home on July 4. This was his fourth overland trip and it was made with a yoke of three-year-old steers. In the fall of 1877 Mr. Rood made one more trip to Wisconsin, by rail, bringing back with him the aged father and mother of Mrs. Rood, settling them in a home prepared for them by loving hands. frequently lectured on the subject of temperance. Throughout his long life he proved himself to be a man of sterling worth. Mother Rood, now at the advanced age of eighty-seven years, resides in North Loup. She is still quite active and enjoys the love of children and friends and the reverence and respect of all who know her. John A. Ballantyne, one of the most respected citizens of Norfolk, Nebraska, was born in Gouverneur, Saint Lawrence county, New York, April 4, 1853, and was the second of eight children in the family of Archibald and Margaret Ballantyne, who had four sons and four daughters. Mr. Ballantyne received his early advantages in New York state, and in 1876 went into the state of Michigan. In the summer of 1878 he came to Knox county, Nebraska, coming overland from Yankton, South Dakota, and walking the entire distance, reaching his new home place, Blyville post office, August 28, 1878, with fifty dollars capital and his chest of tools, as he was a carpenter by trade and followed the occupation of contractor and builder. On December 13, 1878, our subject was joined in Knox county by his father, mother, two brothers and two sisters who came overland via the Yankton, South Dakota, route, and three years later a third sister joined the family. Mr. Ballantyne and his father and brothers became quite extensive land owners in the county of Knox, and the father was known as an old time pioneer in that section. Three members of the family died while residing in Knox county, Mr. Ballantyne's mother, and brother Walter, died in December, 1905, and his father died in December, 1909. At the present time two sons and three daughters survive: Mary, who is married to James Balentine, who reside in Knox county; Alice, who is married to Henry Weigand, who reside in Knox county; George B., who is also married and lives in Knox county; and Agnes, who is unmarried and resides at Hartington, Cedar county, Nebraska. Mr. Ballantyne, the subject of this sketch, resided in Knox county about four years and then moved to Hartington, Cedar county, Nebraska, and continued his business of contractor and builder for two years; then was affiliated with the Wilcox Lumber Company in Hartington for three years; and then resumed his trade in connection with the furniture and undertaking business. In 1889, our subject became connected with the Edwards-Bradford Lumber Company, going to Osmond, Pierce county, Nebraska, as manager of the yards at that place for eleven years; he then moved to Norfolk, Nebraska, having become traveling auditor for the Edwards-Bradford Company, and in February, 1908, became resident manager and distributor for their business in this locality, in their local lumber and coal yards, where he is still located. Mr. Ballantyne was united in marriage November 25, 1885, to Miss Lyda E. Paddock. Mrs. Ballantyne was born in Ohio, October 27, 1855, and is a daughter of Solomon and Evylin (Whitney) Paddock. Mr. and Mrs. Ballantyne have a fine family of five children, whose names and histories are as follows: John A., junior, who is married to Miss Jennie Benning, lives in Gregory, South Dakota, and has one child, is also connected with the William Krotter Company; Robert S., who is with the Edwards-Bradford Company in Norfolk; and Byron W., Bernice Evaline, and George W., who reside at home. Mr. Ballantyne is one of the foremost business men of Norfolk, where he owns a fine modern home and all improvements, and he and his family are prominent in the social and church circles of their home town. They are members of the Presbyterian church, and Mr. Ballantyne is a member of the Ancient Order of United Workmen. He is a republican. had a comrade who was scalped by the Indians, but who is still living. At their golden wedding anniversary, Mr. and Mrs. McIninch had with them seven of their eight children and, six grandchildren, and it is a remarkable fact that at that time there had been no death in their family. They have lived on their original homestead since first coming to Nemaha county and the deed to their land is signed by President Buchanan. It is believed Mr. McIninch is the only man living in Nemaha county who owns an original homestead which was secured at so early a date. His present comfortable home stands but a few feet from the site of their original log cabin. They have the respect and esteem of a large circle of friends and are a splendid example of the highest class of pioneer families. Mrs. McIninch at one time drove Indians out of the cabin with a stove poker, after which the chief wanted to trade "squaws" with her husband. She was left alone with a baby and two small children during her husband's frontier service and was not afraid to look after her own interests in order that her husband might give his help in a good cause. Mr. McIninch and his four sons belong to the Masonic order and he has had canes made for all of them out of a walnut log that was a part of the first log cabin built for the family in 1856, the emblem of the order being engraved on the canes. Benjamin F. McIninch and wife had children as follows: Sarah, deceased, was the wife of Richard Bryant and left four children; Cora, wife of William B. Waite, of Cairo, Nebraska, a pioneer of the region, has two children; John, principal subject of this sketch; Amos, of Custer county, is married and has one child; Otto, of Mason City, is married; Frances, wife of James Reardon, lives in Nemaha county; Belle, wife of Walter Parker, lives in Nemaha county, Kansas; Benjamin, living with his parents, is married and has one child. John W. McIninch was educated in his native county and lived on the home farm with his parents until the time of his marriage, at the home of the bride's parents in Nemaha county, March 13, 1888, to Ida Nelson, daughter of Carl and Margaret Nelson, a native of Indiana, who came with her parents to Nebraska in 1885. In April, 1888, the young couple came to Custer county and settled on a tree claim five miles north of Mason City, where they began housekeeping. The family moved to Mason City in 1903, and have since lived there, Mr. McIninch having extensive business interests in that city. He has always been prominently identified with the growth and upbuilding of the region and is actively connected with various business interests. He owns considerable farm land and has been a leading stock man in the county. He was one of the organizers of the First State bank of Mason City, which was later absorbed by the Mason City Banking Company. He is a republican in politics and is well known in many circles. He is a member of the Masonic order. Two children were born to him and his wife, Amy and Arthur, both at home. Reno J. Miller first came to Nebraska in 1884, reaching Plainview on February 28. He filed on a homestead six miles south of Plainview, where he resided ten years before moving to town. After a year in town, he returned to the country, the meanwhile having sold his homestead and purchased another farm, five miles southwest of Foster, which he occupied until March 1, 1908, making his home since that time in Plainview, leaving his eldest son in charge of the farm. Mr. Miller was born in Butler county, Iowa, June 24, 1862, where he grew to manhood and followed farming until coming to Nebraska. He is a son of Charles and Catherine (Lewis) Miller, both natives of Pennsylvania. They migrated to Butler county, Iowa, in 1858, where the father was engaged in farming all his life. Mr. Miller was married in Butler county, Iowa, January 12, 1884, to Miss Ida Berry, a native of that state. Her father, John Berry, was born and reared in England, as was the mother; they emigrated to Canada and later to Iowa, settling near Cedar Falls. Mrs. Miller passed to her reward May 5, 1905. Five children were born to her: Ernest, who married Pearlie Holmes and lives on his father's farm, their son Orville Edward, being the first grandchild; Forest, Arthur, Gertrude and Grace. Mr. Miller is a republican, and a member of the Methodist Episcopal church, and is also affiliated with the Independent Order of Odd Fellows and Modern Woodmen of America lodges. the two men went to town. Stopping a moment at Mr. Miller's place to get some letters to mail, he was in the house but a few minutes, and coming out could hardly see the team. Opening the barn doors so his stock could enter, the two men managed to find their way back to their starting place and here both families spent the night. By good fortune none of their stock was lost. The next morning Mr. Miller assisted in getting to their homes the children who had been kept at school all night by the storm. During this blizzard it was noticed that there was a strong charge of electricity in the air. Mr. Miller and his neighbor amused themselves with sparks of the fluid that would fly between the poker and the stove when brought close together. Mr. Miller was in the track of the severe hailstorm of June, 1890, and when it had passed, his cornfield was as bare as if freshly plowed. However, he got to work with a cultivator and the beaten sprouts of green came out again and made a fair crop. Neighbors who neglected cultivation had no crops at all. Mr. Miller has noticed that there has been a change since 1898; the planting of numerous groves and the cultivation of the soil seemingly have caused a greater fall of rain. Land which at that time was a sandy waste is now a region of fertile farms, producing large crops of excellent corn. Mr. Miller and family enjoy the esteem of all who know them, and Mr. Miller's success is an excellent example of what perseverance and integrity call accomplish. Among the old settlers of Nebraska who have spent many years in the work of building up and developing the commercial industries of a new country, the gentleman above named holds a prominent place. He came here in the pioneer days and has watched the growth of this section from its early organization, and his name will occupy a foremost place in the history of Merrick county and vicinity. Cyrus Kellogg, farmer, son of Joseph and Adaline (Corey) Kellogg, was born in Steuben county, Indiana, September 4, 1848, was a twin, and sixth in a family of eleven children. He has two brothers residing in Indiana, one in Michigan, one in Williams county, Ohio, and another in Oklahoma; he has two sisters residing in Indiana, and the other children are deceased. The father died December 12, 1876, and the mother on July 3, 1880, both in Indiana. Joseph Kellogg was born in the state of Connecticut and his wife in New York state. They were married in New York state and emigrated to Indiana, in the early days when they had to cut roads through the timber. Cyrus Kellogg received his education in the home schools and later engaged in farming. In September of 1871, in company with three other men, Mr. Kellogg drove overland to Merrick county, Nebraska, and homesteaded eighty acres in section twenty-four, township twelve, range eight; and timber-claimed one hundred and sixty acres, and also pre-empted one hundred and sixty acres. On September 25, 1873, Mr. Kellogg was married to Clarice M. Shoemaker, of Iowa. To Mr. and Mrs. Kellogg eight children were born, six of whom are living: Clarence W., who resides in Keith county, Nebraska; Cora A., wife of H. L. Willard, has four children and resides in Chapman, Nebraska; Cyrus J., who lives at home; Chester B., resides in Keith county, Nebraska; Cozetta B., wife of A. Klingenberg, has one child and resides in Merrick county; and Cecil K., who resides at home. Celora and Clyo died in infancy. Mr. Kellogg has been prosperous and successful and owns six hundred and sixty acres of land, three hundred and forty acres in Merrick, and three hundred and twenty in Keith county, Nebraska, four hundred acres of which is under cultivation. He is a progressive man of affairs, interested in all pertaining to the welfare of his state and county. He has served as justice of the peace four years; was instrumental in organizing his school district number two, and, served as director of same for some years. He is widely and favorably known, and holds the respect and esteem of all who know him. Mrs. Kellogg was a daughter of Jacob and Sarah A. (Brunt) Shoemaker, the former born in Pennsylvania, and the latter in Indiana. They emigrated to Iowa in 1846, and came to Merrick county, Nebraska in 1871. Mr. Shoemaker died in Grand Island, Nebraska in 1896 and his widow is now a resident of that place. Mrs. Kellogg, has one brother residing in Merrick county, one in South Dakota, one in Custer county, Nebraska, one in Hall county, Nebraska, and another in Oregon; a sister who resides in Grand Island, one in Fremont, one in Hall county, and another in Norfolk. Mr. Kellogg and family are now living on the eighty acres on which he made his orignal [sic] settlement. He first built a sod house, in which he kept batch for about a year and then built a one room frame building fourteen by sixteen feet. This is now a part of his present home and later he added another room. In 1898 he erected his present residence. His first year Nebraska was a good one for him, but after that until 1896 conditions were as a rule very unfavorable and there were times when he burned corn which at ten cents per bushel was cheaper than coal. He has passed through all the trying experiences of early pioneer days, and of all the settlers who came at about the time Mr.Kellogg did there are only four left in this locality. Mr. Kellogg has resided continuously on his present place for over forty years.